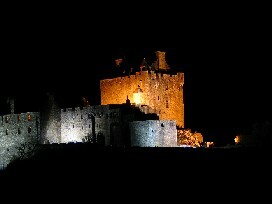 Turn to the west for the fairy tale Eileen Donan Castle (the Island Fort), the ancient stronghold of the Clan Macrae. Three lochs meet here - Loch Duich, Loch Long, and Lochalsh; the Sound of Sleat is all that separates you from the Isle of Skye. There is a regular summer ferry to Skye from Glenelg and a free bridge at Kyle of Lochalsh to take you over the sea to Britain's most famous island. Kintail is an ideal centre for walking and boating. Walks and climbs begin almost at the cottage front door, and geologists and geographers will find many features of particular interest. Kintail is also the base from which to explore Skye and the west coast, including the Benn Eighe Nature Reserve, Applecross and the Inverewe sub-tropical gardens. It is ideal for a holiday. Take the 200-year old road through the forest to Mam Rattagan and you suddenly come on a most beautiful view of mountains and lochs (see above). This is Kintail. Look to the north, and lying before you is the breath-taking Five Sisters of Kintail, a range of peaks over 3,000 feet in magnificent National Trust land. Beyond them, in the distance, the rugged Ben Fhada (the Long Mountain) marks the mountain pass to Glen Affric, the clansmen's way to east. And still beyond these there are the Falls of Glomach, the Britain's second highest waterfall, almost twice the height of Niagra.